The old adage that getting all your bad luck out of the way means you should have a good race rang true for the Balfe Motorsport Team at Brno, for Round 5 of the FIA GT Championship. The opening rounds of the championship gave the team some stressful races, with melting gear linkages and overheating drivers being just two of the problems during the three-hour events earlier this year. However, the race on Sunday afternoon at Brno went like clockwork for the Spirit Kia based squad. It was the build up to the event that saw the stress levels peak! It was yet another venue that Shaun Balfe had never seen before, so the two free practice sessions were going to be crucial for him to ‘get his eye in’ if the whole team were to keep up the pressure on the GruppeM Porsches once again over the course of the weekend. The opening practice started well, with some exploratory laps being set, first by Shaun Balfe, then by Jamie Derbyshire. But, halfway through the session a small oil leak was spotted and with the entire weekend still left to run, it was decided that an investigation as to the cause would be the best course of action. So, the Mosler was backed into the garage – shared this weekend with the Ebimotors team and its Porsche – and the crew began to check over the rear end of the car. The eventual cause turned out to be a slightly worn engine seal and was easily remedied. But it was track time that the team, with regards to set-up and data and the drivers, could have done with. A small amount of fettling was also required on one of the front brake calipers too: this was the first time the car had turned a wheel since Imola, so a slight delay in getting out for the start of the second session also cost time. Jamie went out first to get some more miles, but then his ride was cut short when one of the Maseratis had a shunt, red flagging the session for the better part of half and hour, leaving very little time for set-up work to be carried out. The final plan was for Jamie to bring the car in ‘hot’ and practice a driver and wheel change, handing over to Shaun with just 20 minutes of the session left to go. However, the final drama was about to unfold as the team dived at the front wheels. Left-hand side man Jason Hancock had noticed that the front wheel nut had stuck slightly as he took it off with the air-gun, so quick thinking he ran into the garage, grabbing a spare so that it didn’t jam when going back onto the hub. But, guess what? The new nut did exactly what he didn’t want it to, stopping halfway through its travel and stripping the aluminum thread in the middle of the nut. A full ten minutes were used up trying to remove the offending item, emptying a full air bottle in the process. In the end, the car had to be wheeled back in the garage and the nut was ground off the hub. End of session and still no real time working on the set-up of the car. The team was certainly on the back foot heading into qualifying the next day. The opening session ended with the Mosler lying in fourth place on the GT2/G2 grid, with the gap to the GruppeM cars a little bit larger than it had been for the previous couple of races. Circuit knowledge and a fully set-up car would account for that margin, and the team was still making adjustments for Jamie and Shaun right up until the end of the second session. 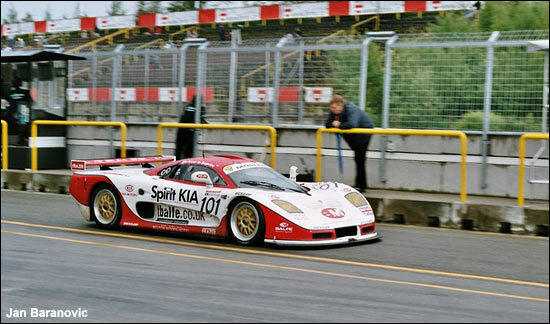 By the afternoon though the Newark Glass Group, KIA Spirit and Spirit Volkswagen-backed car had been promoted up the grid by default, when the number 88 GruppeM car and the Ebimotors Porsche both had their times disallowed for being under the specified ride height. It was a case of good fortune, as the team expected the second session to be hotter and therefore slower, so keeping hold of what was essentially a ‘front row’ starting slot was looking good. The Collard/Sugden pairing tried hard to get back onto terms with their team-mates during the afternoon session, but eventually their fastest time would only be good enough for fourth place. It was pleasing to Shaun, during the post qualifying press conference, to hear Tim Sugden acknowledge that they were actually lying fourth on the grid (as oppose to third in the GT2 classification, behind the Mosler too). On Saturday evening the mechanics and truckies had been entered into the GTR challenge and some amusing inter-team rivalries appeared over the course of 27 minutes of hard fought racing: well, it was mostly spinning into tyre barriers, but it felt like racing! Race day, in comparison to the start of the weekend, was relatively easy for the team. Shaun managed to surprise the pole sitting Porsche for a couple of corners at the start, and lead GT2/G2, before dropping back down to third by the end of the opening lap. The team was surprised to see the number 88 GruppeM car retire in the first half of the race, promoting the Mosler briefly to P2. From that point on, it was a case of keeping collective heads down and handling what was about to become very mixed conditions. Team Manager Simon Ranyard held Shaun Balfe out for as long as possible on slicks, after the heavens finally opened, to make it to the pit-window to hand over to Jamie, meaning no need to sacrifice track position with an extra stop for tyres. Jamie got the brunt of the bad weather though, with it teeming down during the first part of his stint - before drying out incredibly quickly. With no standing water or puddles anywhere to cool his tyres, it was going to be a difficult run to the changeover window for him. He stated over the radio that the tyres were struggling on what was essentially a dry track. As the clouds still circled overhead, it was a waiting game to see who pitted ahead of the team for what choice of tyres. The car behind Jamie pitted early and opted for intermediates, and on the drying track he started to eat into his minute and a half lead by up to five seconds a lap! Jamie kept turning in the laps, although battling with a car that really wanted rain and was proving to be a bit of a handful in the quicker corners. A sterling drive meant that he was able to go slightly longer than his planned stint, as the team kept him out for a couple of laps extra to make sure that slicks were the way to go for the run to the flag. A smooth driver-change and stop meant that Shaun headed back out with a car that was easily capable of over-hauling the Porsche that had managed to sneak past Jamie just before he pitted. 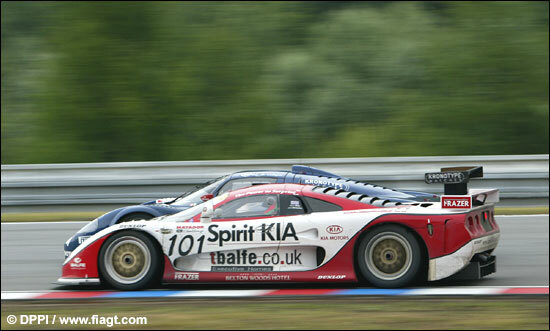 An uneventful run to the flag meant that the Balfe Motorsport Spirit Kia Mosler picked up its second, second place result of the season, proving again that the factory backed Porsches are not totally bullet proof after all. A very wet podium ceremony, with both champagne and rain, ended the weekend for the team with another solid result in the bag for the Mosler on the international stage. “It was hard work when the weather changed,” said Shaun Balfe afterwards. “The car was faultless and at the beginning I was taking it easy, but I didn’t know the team was going to keep me out on slicks for as long as they did! It was certainly getting tricky. I don’t think I’ve ever driven on a wet track for that long without grip before! “It was very wet when I first went out,” commented Jamie Derbyshire, “but it started to dry really quickly and the team came on the radio within ten laps or so to ask me to run off line and cool the tyres down. To which I replied that there wasn’t much water to run off line on!